I gave up rug hunting a few months ago, beaten down by the prices and options. The husband, however, hadn't given up faith. "Wanna go check out that rug place?" he asked two weekends ago. Whatever. Sure. Blah. Blah. I guess it had been long enough to where I could try again. So we ventured down to Myer's Carpet (1500 Northside Drive; Atlanta 30318; 404-352-8141). I'd been there once before (see the post here) and the hubs had only seen the samples I brought back. Last time I visited, I was sticker shocked; the least expensive scrap rugs cut to my custom 8 x 11 size would have still been nearly $300! One piece of good news here is that we realized the pre-made rugs rolled up and stacked against the walls were more reasonable than I remembered. We found some neutral, durable 9 x 12 rugs for anywhere from $250 to $600. Of course none of these were your fancy orientals or fine fibers — but they would have done the job of covering our master bedroom floor just fine. A $250 pre-made rug from Myer's Carpet we almost bought (9 x 12). However, we weren't enthralled. There wasn't one rug that begged, "take me home!" I casually mentioned to Dan that we could maybe check out Excel Carpet in Dunwoody before we called it a day. I called and asked, "Do you have pre-made rugs, say 8 by 11 or 9 by 12?" A friendly voice said something to the effect of, "No, I don't think we have any pre-made ones in today... but I could tell you how much having one made would cost." (I anticipated a tough-to-stomach number but asked for more detail anyway). "Sure, what's the average price?" I asked. When we heard, "Oh, probably $175 or $200," we were sold. Since we didn't have anywhere to be that particular Saturday, we made the trek up 400 to Excel Carpet (8345 Roswell Road; 30350; 770-650-5959). If I would have visited the Kudzu page for Excel in advance, I would have seen 76 5-star ratings. The show room and remnant "warehouse" at Excel are about an eighth of the size of Myers', but they made up for it in price and customer service. We were greeted by a friendly employee named Russ, who helped us in a not-overly-salesmany way throughout our entire visit. We asked for quotes on a few rugs — and he looked hesitant to tell us when a rug would be closer to $200 than $175. We told him not to fear, that the prices were still very reasonable. He answered our questions, told us what was most popular and walked us through the timeline (rugs are usually ready the Wednesday after you order them). Excel works like this: remnants stacked along the wall are marked with their dimensions and prices. You buy the WHOLE remnant (even if it's a little too big) but the binding is at no additional charge. And we saw big ole remants (14 x 8 and crazy sizes like that) for under $300. You can also shop from large rolls of their popular carpets — these are sold by the foot and do not include binding. Then there are seagrass options, for which they only charge for binding. (To put some numbers around that, a 11 x 7 foot seagrass rug would have been about $180 for the binding). Excel carries berbers, polyesters, etc. etc. in mostly neutrals but a few patterned carpets. And I should also point out that while Excel has nice items, Myers has more in terms of high-end/expensive options. Shaggy, multi-colored fiber carpet that can be made into rugs per your specs. We opted to buy some slightly shaggy, multicolored carpet (off a large roll) in 11 x 7 versus 9 x 12. That way the rug would be about 20 inches from each wall in our master bedroom. With the the necessary binding it was $183. We also have our eyes on a nice, large berber roll that is $179 (would have free binding). If we were to come into some money and need a new living room rug, I'd get one in this pattern made. Love. We left Excel feeling good about the customer service, selection, pricing and information. I didn't know to to dislike our other store experience until we went to a place with a much more customer-focused vibe. Our one regret is that we didn't REALLY diagram where our furniture was, how deep each piece is, etc. We would have maybe made the rug just a little bit wider — not because it HAD to be wider but because aesthetically it may have made more sense. Still, we're very happy. Just before Christmas, I blogged about the fabulousness that is Hurs Wholesale Jewelry Mart(just inside 285 on Buford Highway*). It's both a good and bad thing that I've stayed away. The prices are so affordable that you can buy a boatload of stuff. And unfortunately, being inside this place makes me want to buy a boatload of stuff! I mean, when you walk in, you almost hear chimes and trumpets of celebration! I wanted to introduce my colleague Elizabeth to the many treasures (brooches, rings, handbags, headbands, necklaces, earrings, etc.) that fill the aisles of Hurs store. Once we entered the magical doors, Elizabeth knew what I meant when I said I could spend hours in this store (which is the size of a small grocery store inside). These were the $40 variety. Had to try one on! Fun, summery and flirty cream necklace ($5). They also carry this in chocolate brown and black. Bam! Love these dramatic statement and bib necklaces. And ooooh the fun bangles! (Mostly $7 to $14). I fondly referred to this aisle as "very rock and roll." Mirabelle, are some of these necklaces not totally calling your name? Chains, metal and glam galore. This one didn't make it home with Elizabeth, but it sure looked good on her. The goods spread out back at the office. $5 (incl. earrings, which I will probably wear separately). Simple, sterling studs for $4 (bringing my total to a whopping $24!!!). Brooch with luminescent purple stones. $10. Sterling snowflake pieces ($16 for the earrings, $12 for the necklace pendant). Oversized crystal pendant on long chain ($5). Total for Elizabeth: about $43. *Some of you may be nervous to hit up Buford Highway. Yes, it is a grab bag of shops, restaurants, cash-n-carries, etc., some of which are run by shop owners who don't speak English. Please know Hurs will not take you out of your comfort zone. Not to mention you may be in such a good mood you decide to take a gamble on one of the neat restaurants nearby. My faves: C'om Vietnamese Grill, Mini Hot Pot (which is BYOB, BTW) and Cafe 101. Traditional French Brunch... at C'om Vietnamese Grill? Went by the Dunwoody location of C'om today to grab some takeout, and I spotted this 'lil chalkboard sign. 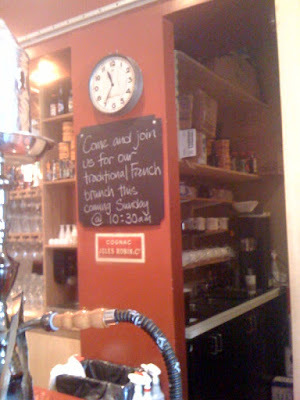 I wonder how well a Vietnamese place does traditonal French. Their CitySearch reviews DO say they have a bit of French flair... I'm intrigued! Look Ma... I Made the Paper! 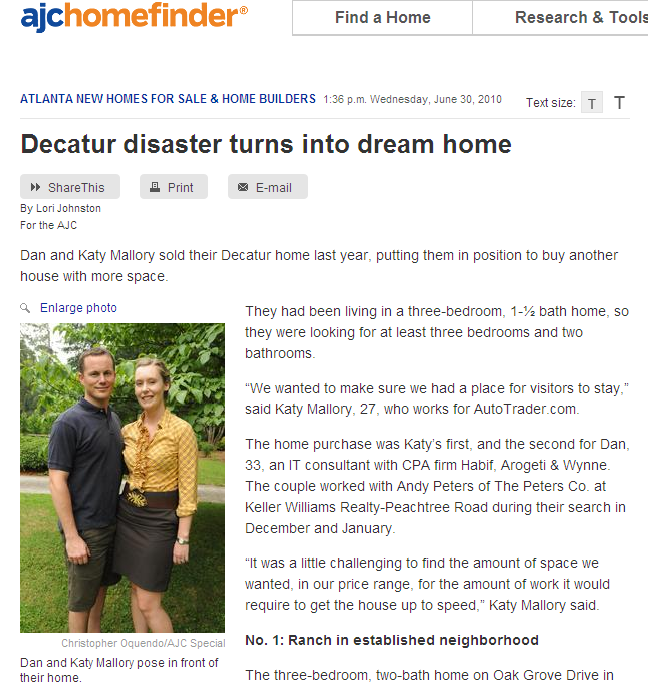 When I got a note from our realtor a few weeks ago asking if we would be interested in being interviewed for an Atlanta Journal Constitution piece about first-time home buyers, I thought it may be fun to participate. After all, we are very happy with the home (and neighborhood - lurve me some Decatur) we ended up choosing -- and I feel like our story shows that if you think creatively and have a little vision, you can (over time) transform an old and slightly downtrodden house into a fresh and modernized one. And we don't have enough good things to say about the Peters Company (our realtors). If you're buying or selling, CALL ANDY AND LESLEY. You won't regret it. See more about our home buying and selling process here. Thanks for the opportunity to be featured in the paper, Andy.